The Neuromuscular Program at Children's Hospital Los Angeles, part of the Children’s Orthopaedic Center, is the largest in the region, treating thousands of children each year with neuromuscular diseases - from cerebral palsy to muscular dystrophy, spina bifida, Charcot-Marie-Tooth (CMT) disease and Rett Syndrome. Our specialists use the latest technology to treat children with various nerve and muscle issues. If left untreated, these disorders typically lead to abnormal alignment, movement and function of the arms, legs and feet, and can lead to dislocation of the hips and spinal deformity. Children with neuromuscular diseases require a global and comprehensive approach to care. As a parent, you will want to work with staff who are well-versed in coordinating the multiple medical treatments and issues to anticipate during growth and development. Treatment plans, include physical therapy, bracing, movement control and surgery. The cutting-edge care our team provides can allow these children to lead more active, functional, fulfilling and pain-free lives. The Neuromuscular Program is a recognized leader for both its clinical and research expertise. The main research focus is on treatment outcomes in children with cerebral palsy, spina bifida and other neuromuscular conditions. We continue to have ongoing government and privately-funded research. The research allows us to optimize treatment outcomes the children we see. The results of our research has been published and presented nationally and internationally, and has enhanced the care of children throughout the United States and the world. Cerebral palsy (CP) is the most common motor disorder of childhood and affects approximately 1 in 300 children in the United States. There are approximately 16 million people in the world, including 1 million people in the United States with CP. In conjunction with the Division of Neurology at Children's Hospital Los Angeles, diagnostic evaluation and management is provided for children with CP and associated developmental disabilities. Muscular Dystrophy is genetic and affects approximately 1 in 20,000 children . There are many forms of muscular dystrophy, but they share the common traits of childhood onset and progressive muscle weakness over time. Our team has extensive experience with children with muscular dystrophy and helps provide care for these patients in various settings, including the multidisciplinary Muscular Dystrophy Clinic at CHLA. Spina Bifida Is a disorder affecting closure of the spinal cord in newborns and affects 1 in 1,000 children in the United States. Childrens Hospital Los Angeles has one of the largest spina bifida clinics in the country. This multidisciplinary clinic provides the comprehensive care these children need throughout their childhood and adolescence. Neuromuscular Diseases is a term used to describe various diseases affecting the nervous and muscular systems in a child’s body. Some of the common conditions for which we treat patients include cerebral palsy spina bifida, muscular dystrophy, Charcot-Marie-Tooth Disease and Rett syndrome. The John C. Wilson Jr. Motion Analysis Laboratory at Children's Hospital Los Angeles is the only motion analysis lab in Southern California, dedicated to the evaluation of children with walking disorders. It is an invaluable tool in assessing children with neuromuscular disease. The motion capture technology used in the lab is best known for its role in the entertainment industry, including cartoons, movies and video games. Our team uses motion capture technology to improve the lives of our patients. Computerized motion analysis allows our expert team to thoroughly evaluate a child’s walking pattern in order to come up with a precise and exact treatment plan. As the child walks through the lab, markers on the skin allow precise measurement of the motion in the pelvis, hips, knees and ankles. Muscle sensors evaluate the timing and magnitude of muscle contraction during walking. Force plates embedded in the floor record the force as the feet are on the ground and allow evaluation of the forces transmitted throughout the joints in the legs.. The complex data obtained in the lab when a child walks helps our team build a comprehensive pre-operative plan specifically for each child. Our research shows that computerized motion analysis results in changes in surgical plans for nearly 90 percent of patients. With leading-edge technology, and world-class staff, the John C. Wilson Jr. Motion Analysis Laboratory serves as a premier referral center for children throughout the Western United States. It is critical that parents and children recognize the commitment involved in bracing, therapy and at-home programs as recommended by the Neuromuscular team. Just walking steadily was becoming increasingly difficult for Marielle. 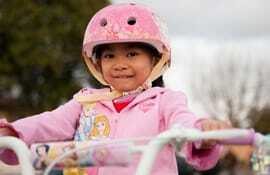 When she came to the Childrens Orthopaedic Center at CHLA she had one wish: to ride a bike. Read more.